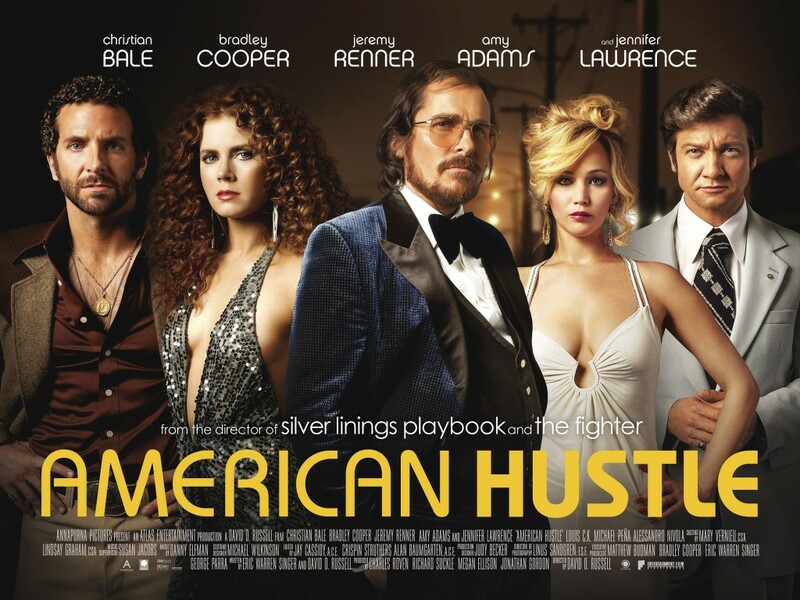 After an unoriginal and lackluster first act that relied on plenty of voice-overs in a clear homage to Goodfellas, American Hustle takes off, becoming a truly funny and engaging film loosely based on the famous 1970s Abscam case, a sting operation conducted by the FBI with the help of two expert con artists. Like in his previous films, David O. Russell seems to have fun with the script, adding a layer of unpredictability and messiness that is amusing to say the least. Instead of feeling disjointed and overelaborate like it has been described by some critics, American Hustle is clever, sassy and provocative, demanding us to empathize with these characters despite their many faults. Set in the 1970s, the film does a great job to capture the fashion and the excess of the era, with a great soundtrack that includes famous tracks from the likes of Tom Jones, Elton John, Donna Summer and a special homage to Duke Ellington. Of special note are the hairdos, which range from Bradley Cooper’s ridiculous perm to Christian Bale’s incredibly bad comb-over and toupee combo. To disregard these very peculiar directorial choices would be to throw away part of the grand design of American Hustle, which is less about deceit than about perception and how each character wants to be projected onto others. The commonality between them is not a desire to do bad nor a simple case of greed, but to be someone different than who they are. Their motivations may get distorted and influenced by love and notoriety but, in essence, it comes back to a deeply rooted dissatisfaction with themselves and the world around them. Christian Bale as Irving Rosenfeld is the closest thing to a lead in American Hustle. His is the most complex and surprising character of the pack. While it may prove useful and possible to frame Richie DiMaso (Bradley Cooper) within a more or less defined set of traits and motivations behind his every move, Irving changes as the film progresses, eventually finding rewards in friendship and love that exceed his lifelong desire to be “someone”. The two female counterparts are as good if not better. Amy Adams as Sydney Prosser proves to us, and possibly herself, that she can be a sexual magnet, who walks, talks and acts the part, without skipping a beat. Though mostly on the background for most of the film, Jennifer Lawrence justifies the size of her celebrity yet again with a commanding and crazily entertaining performance that takes over the screen with a whole lot of attitude and ridiculousness. It is, by far, David O. Russell’s most playful creation, and the one that infuses life to the script when the film begins to lag. Though it is far from a perfect creation, American Hustle has many pleasures, none of which are readily apparent. It may be messy and overly long, but it hardly ever ceases to be interesting. One of the best films of 2014. I really enjoyed it and it went by really quickly. Amy Adams was surprising in this type of role, which I liked and it was amazing to see what Bale did for this role gaining so much weight. Christian Bale is fond of picking these types of roles in which his physique needs to change completely. Amy Adams was indeed surprising as was Jeremy Jenner, who usually plays far more serious roles. It was nice to see De Niro kind of poking fun at himself too playing a gangster if only for a brief amount of time. Great review, Niels. I still need to see this one, but your positive remarks have me more inclined to get to it sooner rather than later. Can’t beat that cast, that’s for sure. It was a great cast indeed. All of them surprised me in different ways, especially Amy Adams in a role very unlike her usual characters, and Bradley Cooper, who seems to keep getting better with every film. Great review Niels! I agree this is highly entertaining and one of the best films of 2014. I don’t think it deserves to win Best Picture however, but I won’t cry foul if Bale wins! His character is the most well-developed and I like his emotional transformation at the end because of his friendship with Carmine. “… [it] is less about deceit than about perception and how each character wants to be projected onto others” Nicely-put. I was proud of that line too, but I won’t take full credit for it since I may have heard it in an informal discussion about the film. I would agree with you in that it doesn’t deserve to win Best Picture, though it is a very worthy nominee. My favorites are others and a couple of them were not even nominated. Didn’t like it as much as you, but it was still enjoyable. American Hustle would have been a better film if David O. Russell focused more on the writing than ‘making it all about the characters’. I really loved how the scenes blended with the soundtrack, I think that’s what I likde the most about American Hustle. Agree the film does a great job to capture the fashion and 70s look.